When will I need new Brake Pads? Re: When will I need new Brake Pads? Okay so had some time to kill before an appointment so dropped into a few places. Mitsubishi - $410 ($225F/$185R) didn't ask about fitting. Repco also has the Kangaroo Paw DBA rotor but over $700 and I'm not sure if that was all up or each end! PLUS I can't find them listed for the CJ on the Repco website. Its a start, still got a few leads to follow. Oh and the JAX guy said the slotted rotors can't be machined, which I kinda knew. Ok so it depends on what you want, could be cheaper to just get a new set, depending on their value. If the stock rotors are still ok I don't plan on binning them, I'll hang on to them if they are needed later or by the next owner. 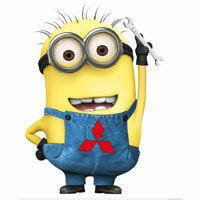 Anyone know what the dealers usually use or if there is a brand name pads Mitsubishi use from the factory? Would dealers use them when doing the work or something else like Bendix? Are the stock pads any better worse? The OEM pads seem to last a long time 80 to 90k is what we are seeing on customers cars. My wife’s VRX has 70k on it and there is about 2mm of wear. I’d say we’ll get 100k out of them. So its likely the first owner could have done them as it had 85k on it when I got the CJ. Might end up doing the pads then new rotors, just see how the money goes. I'll take a close look tomorrow and might get a 2nd opinion before doing anything. On my way home today. He might be thinking of going through while you stop. His brakes are fine, just his ute tyres locking up. Rule is stop if its safe to, others think Amber = put the right foot down! Okay 99% of the time I keep and eye on traffic when getting to lights, know whats there and if its safe to stop, in this case the car following be pulled off, the light change and I stopped. Not hard or with ABS kicking in, I just stopped. IF he had hit me then its his fault for not keeping a safe distance. I admit it was a close call, looks almost tame on the video but in the moment it was an OMG moment. Weird thing is he never said a word. Sat there kind in the next lane waiting for the lights. Didn't raw past me or anything, actually I left him behind off the lights and still didn't break the 70 speed limit. BTW this is coming out of Caloundra, on Caloundra Rd the at the Sugar Bag Rd lights, for those who know the area. Used to be an 80 zone until they did some upgrades and lowered it to 70. I'd say half the drivers still do 80 along there after the lights. Craig's vehicle is same as mine, so what I've got installed will fit for sure. DBA ones are pretty good, but obviously if you change rotors make sure you change to new pads at the same time. Is that the DBA 'kangaroo paw' slotted rotors? Yeah pads first when needed but I'd like to do the lot together. BTW looks as the front rotors are not bad, some light imperfections like record rings but no lip on the edge. I'll get out my digital caliber to measure them this morning to see if they have been machined and check the rears at the same time. Okay just inspected all the rotors and measured them, aprox 25mm front and 10mm rear, so I'm thinking they have never been machined. I did note they are all smooth with no lip BUT the front left (passenger) does have some slight ripples, not very much but slightly more than the other front. If needed I'd just get some pads and do the rotors later but still aiming to get them all on at the same time. I'll also touch up the yellow when I'm doing it. Yeah like I said, you definitely don't want to put old pads on new rotors, so if you are considering it then you will want to do them at the same time, otherwise you may find yourself needing to buy new pads. Even if you only do 1000km with the new pads on the old rotors, they may develop ridges that match your old rotors, so they wont have as much contact area with fresh rotors, resulting in poorer braking performance. The kangaroo paw rotors actually refers to the ventilation design, but yeah, they work well. I don't know that you would see much difference over non-ventilated rotors in normal conditions, but they do have a superior cooling design so anything heating up your brakes more than normal should be where they excel. The reason I replaced my motors was because I had some pulling/juddering when braking that wasn't resolved by wheel alignment and checking tyre pressure. Changing rotors (and pads at the same time of course) fixed the issue. Also, make doubly sure to get some brake cleaner or degreaser on the shiny metal surfaces of the rotors after installing (but not any painted areas) to remove the oil they typically coat them with. They ship them with oil on to stop them rusting, so when you open the box they are all nice and shiny. Rotors usually rust super quick, particularly if they get any moisture on them. I've left my car out in the rain overnight and come back to a nice coat of rust on the rotors. Thanks for the advice on cleaning new rotors, something I didn't think of. Yeah I know they rust, some weekends when I wash the car, park it in the garage without a proper drive, then the next day a light rust coat you can actually feel the drag on the brakes backing out the drive. Its the only time I hear them make noise.